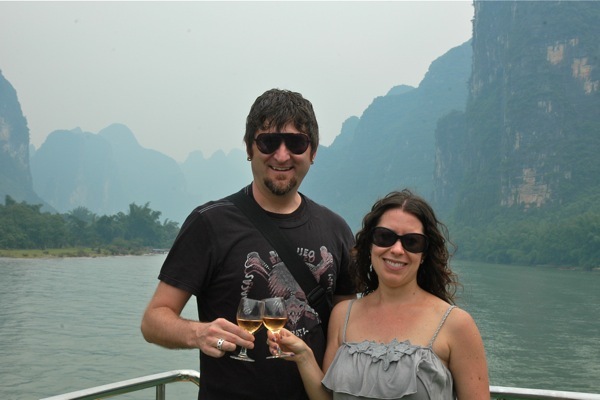 I’d wanted to go for a couple of years, so when Jay and I were able to take a last-minute cancellation, I was excited – even though our reservation wasn’t until 9:30pm and I had just flown in from the east coast that day, meaning my body thought it was after midnight. I’m not sure this helped with my enjoyment of the meal. The Cyrus space is hushed and formal, with barrel-vaulted Mission ceilings and men in suits. 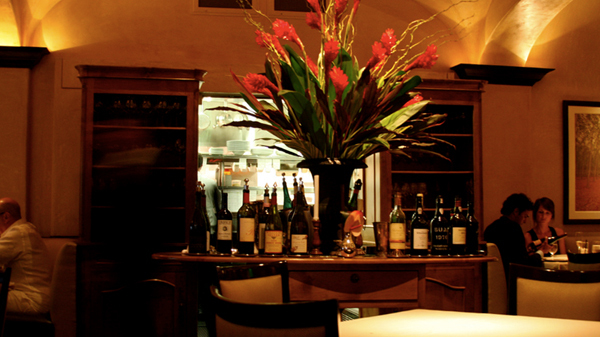 Strangely, considering we were in usually laid-back California, it seemed even more formal than similar types of restaurants we’ve found in New York (Le Bernardin, Daniel, etc.). 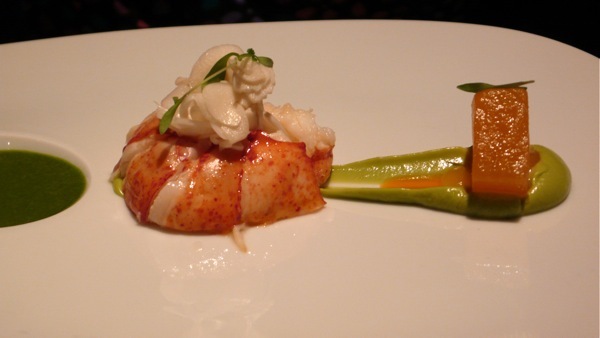 We ordered the Chef’s Tasting Menu, a five-course menu plus amuse bouches, a cheese course, and dessert. Our stomachs had not been in training for such a meal since our European Culinary Extravaganza of 2009, and it was tough for us to make it through. 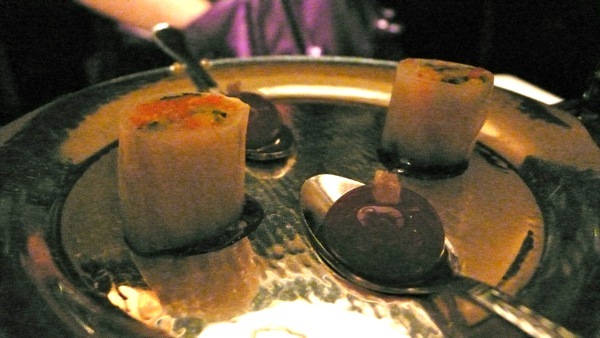 The first amuse bouche was a flavor trio of salty, sweet and sour, and umami. Salty was represented by smoky eggplant on a spoon, smooth as silk, and clam with gelee and paprika; sweet and sour by something that resembled a grape on a spoon, but more delicious, and a a spring roll, cut like sushi, with daikon radish and sour plum paste; and umami by a rich and spicy shitake broth. The second amuse bouche was mackerel sashimi with miso gelee, daikon radish, and red plum, with a light yet complex flavor. 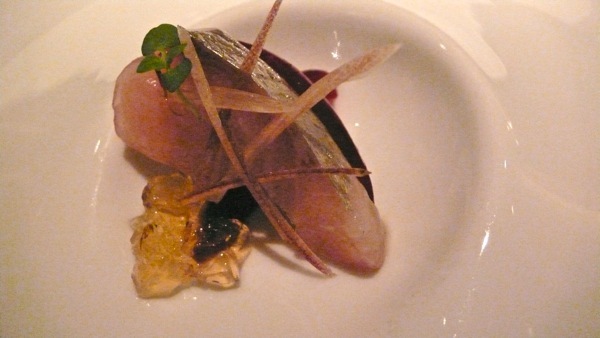 Mackerel sashimi with miso gelee, daikon radish, and red plum. On the sommelier’s recommendation for a local wine that was a little different, we ordered a 2007 Lutea Russian River Valley Pinot Noir, which tasted of red fruit, marigolds, and earthiness. 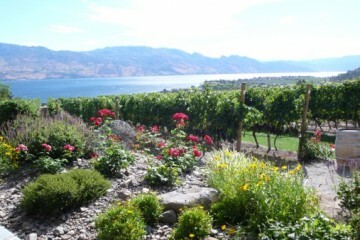 Lutea produces only Pinot Noir, sourcing its grapes from organic and biodynamic growers. 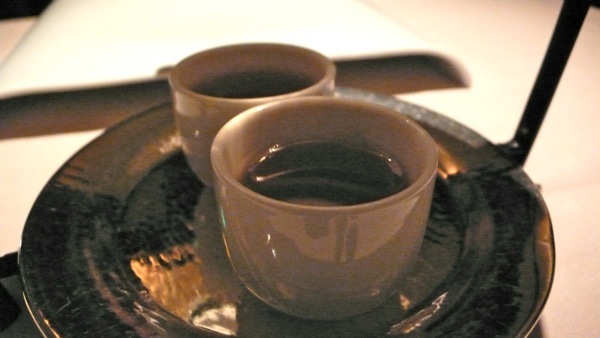 While unusual, the wine was a little too candy-like for our taste (though we drank it anyway!). 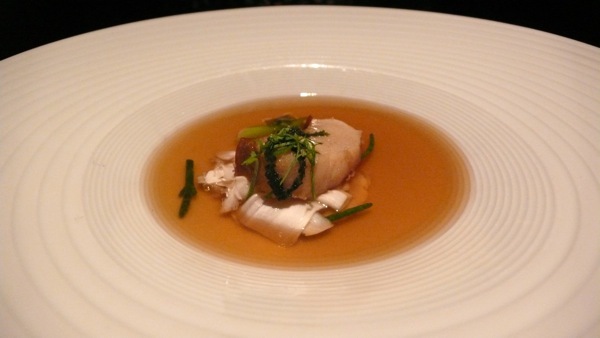 Abalone with matsutake in a kinoko-mushi broth. 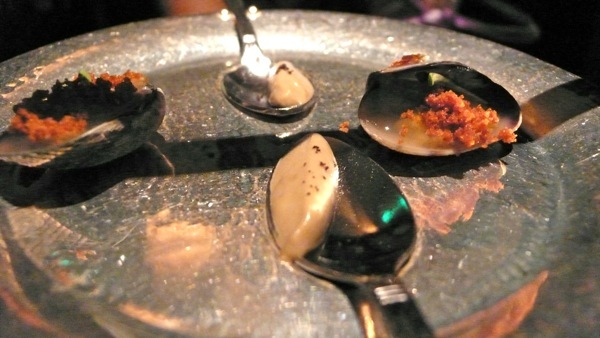 The foie gras dish was a study in one ingredient – figs – a theme, which we were to see recur over the course of the meal. The delicious, creamy foie gras was served with fig in a balsamic reduction, a fig buttermilk biscuit, and fig paste rolled in pistachios. While I usually love figs, it was almost too many figs for my taste. 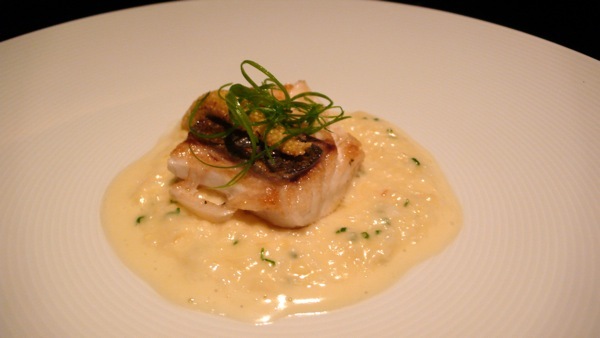 Medai with sweet corn, scallions, and lemon verbena. 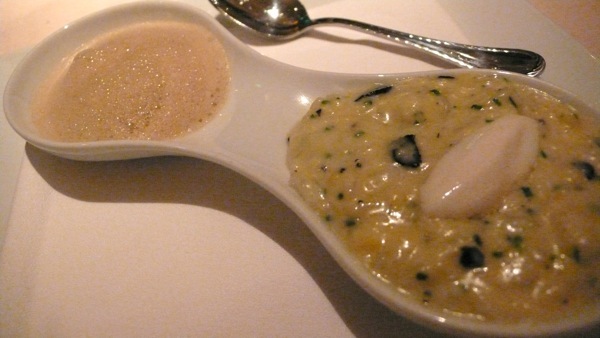 Sweet corn and black truffle risotto with maitake mushroom foam. My next course was a deconstructed, inside-out Butter Bean Ravioli, with arugula, a slow-cooked egg, and chanterelle mushrooms on Parmesan foam atop a ravioli with butter beans. It was pretty good, but had a little too much going on and didn’t achieve a great balance of flavors. 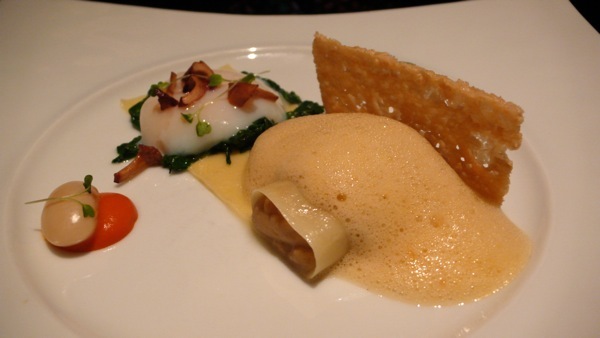 Butter bean ravioli, with arugula, a slow-cooked egg, and chanterelle mushrooms on Parmesan foam. 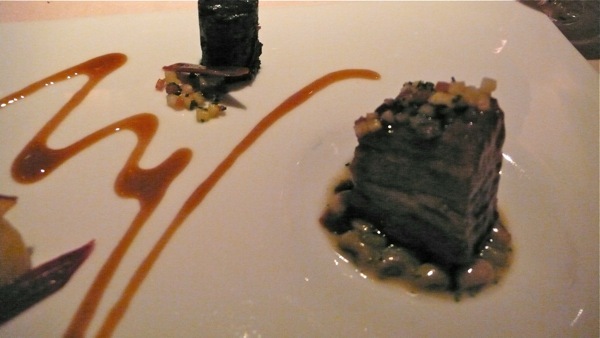 Jay had the Bourbon-Glazed Pork Belly with Black Eye Peas, Red Chard, and Apples. He thought this was a very well-balanced dish, with the flavorful pork cutting through the smoky peas and rich greens. Bourbon-glazed pork belly with black eye peas, red chard, and apples. My final savory dish was the Roasted Duck Breast with Spiced Confit Bun, Garlic Chive, and Asian Pear. (Again, this had a couple different preparations of duck: The confit in the bun and the roasted breast.) The duck was tender and paired well with the slightly salty bun. 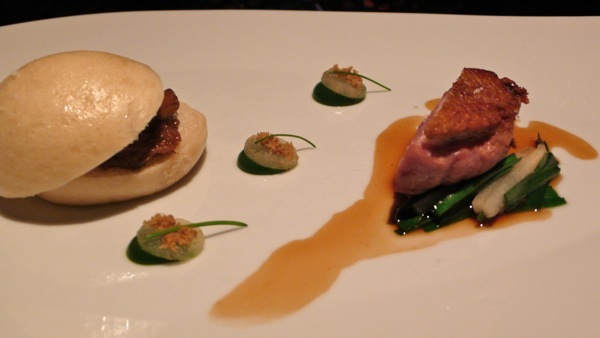 Roasted duck breast with spiced confit bun, garlic chive, and Asian pear. 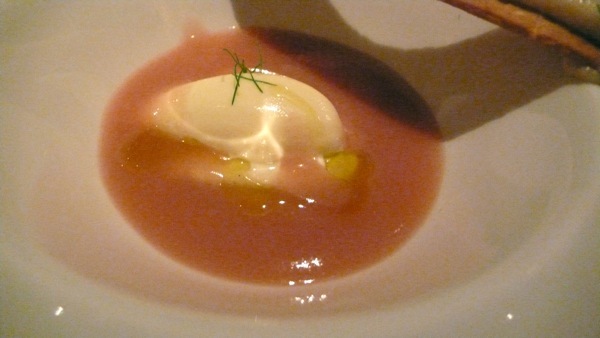 Jay was a little disappointed with his Striploin of Beef with Daikon and Ginger-Tomato Consommé. Here was another study in one ingredient – tomatoes. 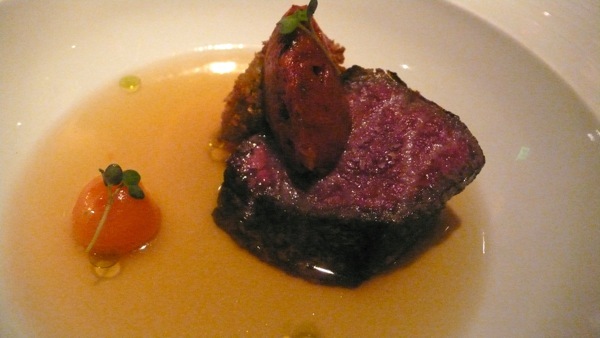 The beef was served with green tomato and fresh tomato paste in addition to the tomato broth and drops of wasabi oil. 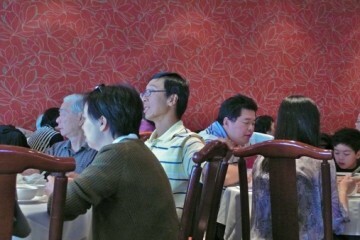 Unfortunately, Jay thought his cut of beef wasn’t great, though he enjoyed the flavors in the rest of the dish. Striploin of beef with daikon and ginger-tomato consommé. 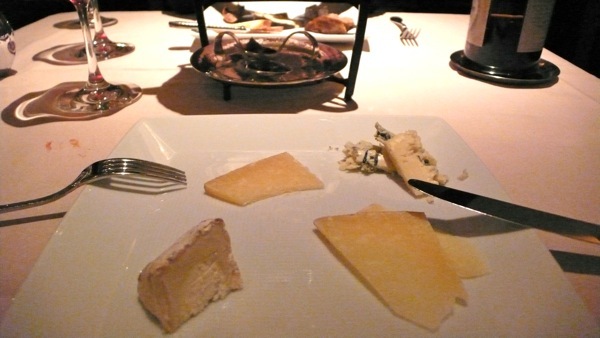 Though we were losing steam by the time we got to the cheese course, we managed to try bites of a few – though were disappointed that more of the cheeses weren’t local. The desserts were solid, though didn’t bowl us over: Passion Fruit Gelato with Miso Custard and Sesame Sable; Mint Chocolate Chip with Lemongrass and Grains of Paradise, served with a shot of hot chocolate; and deconstructed Red Velvet Cake – my favorite of the desserts – with cream cheese and graham cracker crumbs beside the cake rather than integrated with it. Passion fruit gelato with miso custard and sesame sable. 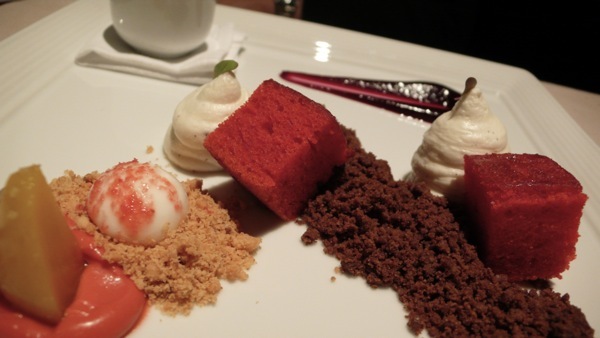 When the petits fours finally arrived, I was pretty much asleep at the table. Luckily, our server let us take them to go. Overall, we thought the meal was solid and tasty, but wasn’t sure it lived up to all the hype we were promised. Perhaps we’ll have to give Cyrus another shot – next time, at an earlier hour. Open Thursday to Monday, 5:30pm to 9:30pm. Reservations essential, two months in advance.